With the awareness about the chemicals in our day to day products and the health concerns associated with them, a lot of us are now making the shift towards trying to use all natural products and eliminate as many chemicals as possible from our homes. Be it homemade lotions, shampoos or toothpastes. One of the problems with making toothpastes is that it uses coconut oil whose taste some people do not like. Also, storage and keeping it fresh is an issue if you make a large batch. A super alternative for this is to make your own tooth powder at home! It is easy to make, it keeps well for longer periods and what’s more, it does the job as well as a toothpaste. Want to know how? Read on! The tube of toothpaste that you swear by is filled with flourides and SLS. Imagine, you are using it on a daily basis and perhaps ingesting some unknowingly too. When you make a product at home from scratch, you know exactly what ingredients go into it and can be sure that it is natural and safe for you to use. So when we make the tooth powder, we are going to be adding all natural ingredients that helps keep your teeth and gums clean and problem free and you can customize it to suit your taste too! So let’s get started with the ingredients. Bentonite Clay It is a wonder product, which when comes in contact with water can get this amazing property of being able to absorb any kind of toxins, heavy metals, impurities or contaminants. Baking Soda It is mildly abrasive and helps in removing any deposits from the teeth. Scrubbing with baking soda helps remove plaque build up and stains. Cinnamon Infuses a fresh fragrance to the mouth. It is also anti-bacterial meaning it won’t allow bacteria to build up in the mouth thereby preventing bad breath. Cloves Cloves have for long been used to prevent teeth and gum problems. It helps in preventing toothaches caused from decay. Mint Need we say why? Of course for the minty fresh breath! It also has anti-microbial properties and will help keep your teeth and the mouth squeaky clean. You can also replace the mint, cinnamon and clove with their respective essential oils. But that would not give enough body to your tooth powder. Also, clove and cinnamon powder add to the abrasiveness of the powder. So it is always better to use them in their powdered form. Mix all the ingredients together in a bowl and transfer into a glass jar. Do not use a metal container. There are two ways to do it. Either make individual jars for each member and dip your toothpaste in it. Or place a plastic spoon in your jar and take out about quarter a teaspoon and sprinkle on a wet brush before brushing your teeth. The powder keeps well for months if you keep it in a dry place. You can increase or decrease the baking soda content depending on how abrasive you want the powder to be. You can also put it in a pepper shaker and use it to sprinkle the powder on your brush each day. 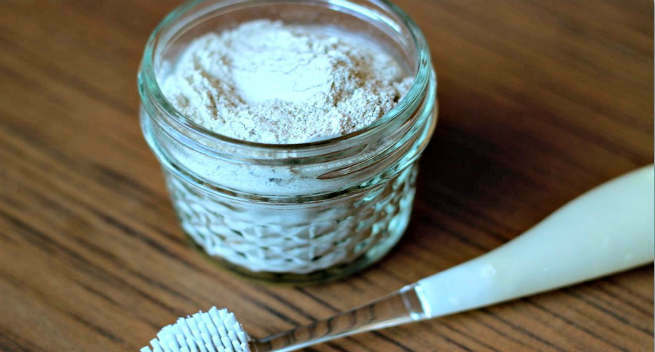 Brush twice a day with this tooth powder and it will keep your teeth and gums trouble free!